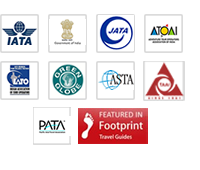 C11 endorsement for top tour operators of India. 2nd highest foreign exchange earner 2001& 2009. 2nd best wildlife promoter 1999, 2003, 2012. Green Globe award for eco-friendly practices. German TUV award for safe tourism. Awarded certification for special promotion of North-East. Best off-beat itinerary, the Golden Triangle with a difference won the most innovative itinerary award in 2010. PATA Green leaf award for eco practices .